While choosing skin care products or best moisturizer for dry skin, it is advisable you read the ingredients list before making a choice. How many of us actually do that? Even if we do, how many women really know what ingredients to look for? Moisturizers form an integral part of a skin care regimen. However, because of their complex ingredients, it often becomes confusing to choose one over the other. If you know what moisturizing ingredients to look for, you can skip the confusion and select the best moisturizing products for your skin. Here are some popular and effective moisturizing ingredients that help make your skin soft and hydrated. AHAs are potent skin care ingredients that help to remove dead skin cells that build up on the surface and relieve skin dryness. They enhance the exfoliation process of the skin thus revealing fresh and smooth skin cells from underneath. This in turn, helps the skin absorb other active ingredients of skin care products more effectively. This is the reason why AHA-based skin moisturizers are able to sink into the skin and deliver intensive hydration. So it is best face moisturizer for dry skin. However, AHAs often tend to increase the skin’s vulnerability to UV damage. Therefore, it is extremely important to wear a sunscreen while using AHA-based skin care products. Antioxidants are specialized molecules that protect the skin from harmful free radicals and thus prevent skin dryness, skin damage, pigmentation and premature aging. Antioxidants are present in oils and waters contained in moisturizer bases. Moreover, they also help to protect skin cell membranes. Dry skin is extremely vulnerable to environmental damage and therefore benefits greatly from using antioxidants. Emollients are powerful moisturizing ingredients that strengthen the protective barrier of the skin in order to enhance the moisture retention capabilities of the skin. They are also excellent lubricants and therefore are used extensively in skin care products. They actually fill in the spaces between rough, dead cells to achieve a soft, smooth look and feel. 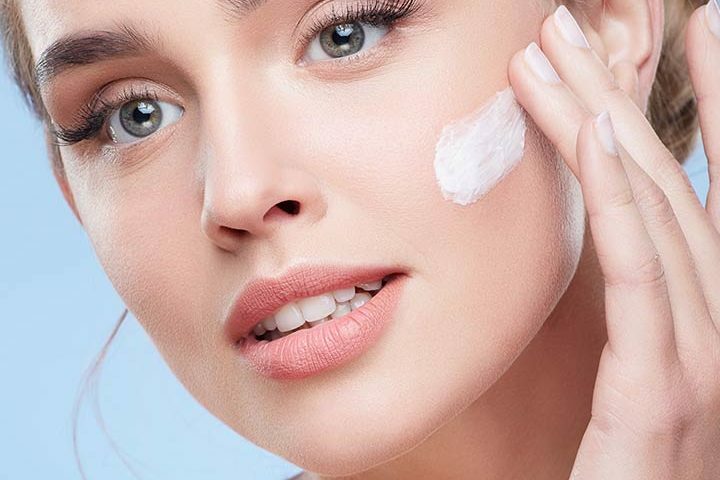 Common examples of emollients are lactic acid, shea butter, petrolatum, lanolin, petrolatum, cyclomethicone, dimethicone copolyol, glyceryl stearates and propylene glycol linoleate, silicone, mineral oil and plant oils. Humectants serve to attract moisture from the air into your skin. However, for humectants to sufficiently hydrate the skin, the humidity of the air must be at least 70 percent. If the air doesn’t have enough moisture in it, humectants will be unable to absorb any moisture and therefore fail to hydrate the skin. Humectants are also helpful to soothe skin damage by sun and dehydration. Some of the common humectants used in skin care products are haluronic acid, glycerin, butylene glycol, propylene glycerol, sorbitol, sodium PCA, urea, panthenol and lactic acid. Occlusives form a thick barrier film over the skin’s outer layers and therefore prevent moisture from evaporating. They are the most effective when applied on damp skin. However, occlusive ingredients are often greasy in texture and tend to clog pores and thus promote acne. Therefore, occlusives are best used by people with extremely dry skin and who rarely tend to break out. Common forms of occlusives include beeswax, caprylic/capric triglycerides, cyclomethicone, hydrogenated castor oil, mineral oil, lanolin, petrolatum, silicone, dimethicone and vegetable oils. Next Post:Can keto ultra diet help in reducing weight?